Rusk is a hair care brand that I've certainly heard of, but I had never tried any of their products. There's no real reason for that, other than that I've never seen their products locally and I really haven't heard a lot about this line. PeopleStyle Watch sent me a couple of their products to try out, and I'm glad they did! 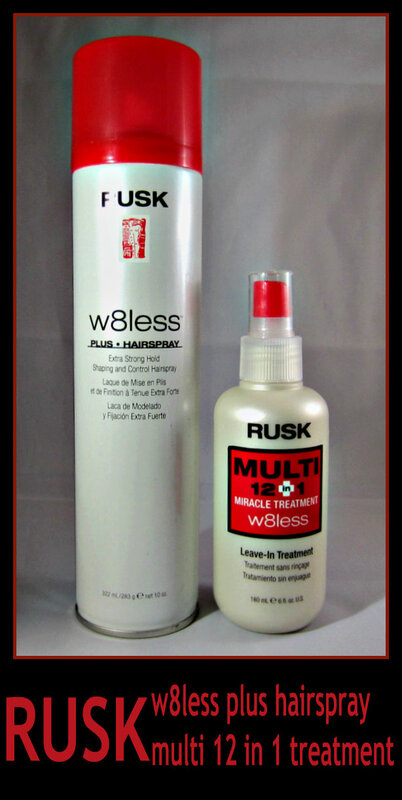 My favorite of the two items is the Rusk Multi 12-in-1 Treatment. I've already picked up another bottle of this (on Amazon), and I think it will be a permanent staple in my daily hair care routine. I like that it's a heat protectant and that it moisturizes hair, because my hair is very fine and suffers through far too much heat styling. What I love the most is the shine and fullness that it delivers, and how well it tames flyaways. I'm constantly trying new hair products and always hoping to find "the one", and I think it's safe to say that this is definitely something that falls in to that description. This gives immediate results, and I really notice a difference on the days that I forget to use it. The hairspray is interesting in that it's more than just a product that offers hold. It can also be sprayed on damp hair before styling, and the heat activates additional control. It states that the heat helps to activate the shine as well, but I didn't find this to be the case. My style does hold better after using this as a styling aid, but when I compare my hair without using this product, it does have more shine. As far as a hairspray, it is very light--maybe too light for me, and I prefer my Sebastian Shaper to the Rusk for this purpose. My hair also looks a bit dryer, duller and less nourished when using this product for any purpose. So in the end, I love one of these products, and am kind of indifferent on the other one! Below you can find additional information and the ingredients for both items. W8less Plus Extra Strong Hold Shaping and Control Hairspray is a versatile design tool that provides texture, natural shine and long-lasting, touchable support. Contains Thermplex™, a unique combination of ingredients that activates with the heat of a blow-dryer to provide shine, control and condition from the inside out. Price: $12.00-$15.00 for a 10 oz. can, available at various online sites. WHO IS IT FOR? For all hair types requiring extra hold. HOW DO YOU USE IT? Mist on wet hair during thermal styling for added hold and support. Use a brush or your fingers with the heat of a blow dryer to infuse the hair with texture and body. To finish, mist evenly for extra hold. SD Alcohol 40-B is a special denatured alcohol that acts as a solvent for the primary ingredients. Hydrofluorocarbon 152A is a propellant. Octylacrylamide/Acrylates/Butylaminoethyl Methacrylate Copolymer Resin, for long-lasting hold. Aminomethyl Propanol Neutralizer for resin. Phenyl Trimethicone imparts shine and a soft feel. Panthenol (Pro-Vitamin B5); provides hair with body and shine. Benzophenone-4 Is a sunscreen that helps protect hair from the damaging rays of the sun. Dimethicone PEG-8 Meadowfoamate Is a conditioning agent that penetrates the hair shaft and improves the condition of the cuticle, as well as the outer shaft. This process is enhanced by the heat of a blow-dryer. Improves combability and shine without surface buildup. A versatile product that addresses all your hair needs: adds shine, smoothes and detangles, control frizz, seals and protects haircolor, prevents split ends, stops hair from breakage, thermal protectant, is lightweight and does not weigh hair down. Ideal cutting lotion. Price: $10.00-$12.00 for a 6 oz. bottle, available at various online sites. WHAT IS IT? A multi 12 in 1 miracle leave-in treatment. porosity; seals and protects. 12. Extends the life of hair color, straightening and other chemical services. HOW DO YOU USE IT? Apply thoroughly through clean, towel-dried hair; comb gently. Do not rinse out. Style as usual. Glycerin is a moisturizing agent that imparts incredible shine to the hair. Panthenol is a hair moisturizer that keeps hair from having a dry, frizzy look. Hydrolyzed Keratin is a naturally derived ingredient that binds to the hair to give it full body and a thicker appearance. Quaternium-80 is a conditioner that provides hair with static control and shine. Cyclopentasiloxane is a silicone fluid that makes the hair easier to brush without breakage. Butylene Glycol is a moisturizer and a hair conditioning agent that helps increase hair shine. Cetearyl Alcohol/Behentrimonium Chloride is a substantive long chain quarternary conditioner known for its mildness. It also helps provide a soft, flexible feel to the hair. *Products featured were furnished by People StyleWatch for consideration.